This state park program unleashes the artist in all of us. There is an artist in everyone, Daddy,” my 8-year-old son Charlie informs me one day as I struggle to comprehend how he could produce such a masterpiece in his art class. I take a long, hard look at this 4-foot-tall, previously unwise, smelly (but cute) animal. And, not for the first time, the innocent perceptions of the young spawn a wonderful notion. As director for interpretation, education and outreach for Texas state parks, what do I know about art? Unfazed, I decide at that moment to start an “art in the parks” initiative for Texas. Art in the parks is not a new concept. Artists have created art in national parks since the late 19th century, when famed Hudson River School painters like Thomas Moran and Albert Bierstadt captured majestic views of our nation’s Western parks. Ansel Adams’ black and white photographic landscapes continue to inspire dreary office cubicles. Some of the first parks in Texas used art to memorialize famous Texian battles through monuments, sculptures and obelisks. The San Jacinto Monument, dedicated to those who contributed to Texas’ independence, stands 570 feet tall, the tallest stone column memorial in the world. It was completed in 1939. Also in the 1930s, the Civilian Conservation Corps (CCC) began implementing one part of President Roosevelt’s New Deal by hiring young men to build a variety of structures in state parks. Artistic dreamers such as the visionary architect Arthur Fehr used design principles to promote harmony with the surrounding landscape. Constructed from native materials, these structures — the pavilion at Garner State Park, the archways leading down to Longhorn Cavern and the Palmetto refectory, to name a few — appear to grow naturally from the ground. The workers became artists and craftsmen; evening art classes in the CCC camps were a highlight, and the camps’ weekly newspapers often showcased the resulting fine art. Long before Charlie inspired me, pioneering Texas state parks taught and celebrated art. Many parks have led informal art and photo contests, and arts and crafts are embedded in our school and outreach programs. Government Canyon State Natural Area staff leads Haiku Hikes; Big Bend Ranch State Park holds digital photography workshops that fill up the day they are announced. Palo Duro Canyon State Park has hosted its Texas musical performance for 50 years. A cast of 60 actors/singers/dancers portrays 1800s Panhandle settler life on an outdoor stage in the second-largest canyon in the country. A horseman carrying a Texas flag atop a 600-foot cliff kicks off the show, and fireworks end the performance each night. 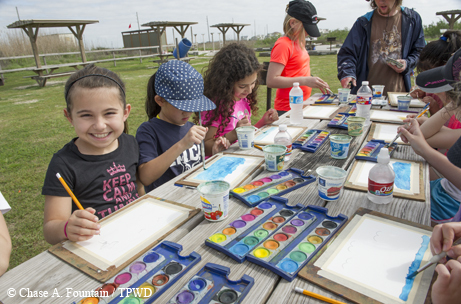 Children put paint to paper at Galveston Island State Park. Art in the parks is not just about creative expression. Author Richard Louv coined the phrase “nature deficit disorder” in his 2005 book Last Child in the Woods, jumpstarting a national movement to connect all children, their families and communities to nature. According to Louv’s Children and Nature Network, Charlie was right — parks are great locations for inspiring art. “This seems clear enough: When truly present in nature, we do use all our senses at the same time, which is the optimum state of learning,” Louv says. So I was inspired, but how to accomplish this? Coincidentally, my wife and I attended a local art class for families. We chose to portray a scene that looked just like Lost Maples State Natural Area, the park we had enjoyed the week before. Our team effort, a masterpiece of fingerpainting, now perches proudly above our mantelpiece. Turns out Charlie was right: There is an artist in everyone! After checking with our pioneer parks already offering art workshops, taking a few online seminars and sending out persuasive emails, we started offering arts programs across the Texas state parks system. Park staffs are always looking for something new to attract visitors, so word spread about the ease and attractiveness of the activities. In that first year (2013), we offered more than 50 park workshops for families and adults alike, and since then, the program has continued to grow. Most parks now provide art-based programs. Some, like Brazos Bend State Park, dedicated their entire summer day camp season to arts. “By taking the time to really observe your world, art in nature allows your mind to relax and become reflective on the moment,” says ranger Lisa Reznicek of Galveston Island State Park. The park has embraced the program with events like the Bayside Paint Party, where watercolors and other materials are provided, along with sunset views. “Let the beauty found in Galveston Island State Park inspire you to pick up a brush and lay down some color. Create a one-of-a-kind souvenir, and make some memories with Ranger Lisa,” reads the event description. Other parks utilized existing programs like digital photography workshops and local artists teaching “plein air” painting in the parks. Digital photography scavenger hunts, activities that match nature’s colors with paint sample cards found at hardware stores, poetry slams, online videography, dances and flash mobs have all followed. How do we measure our success? From the numbers of participants in these programs and the enthusiasm of their response. Families visit our parks and tell us that this is exactly the kind of program their children need. We’ve now repurposed much of the Junior Ranger Journal to include more arts experiences. A drummer keeps the beat during a musical performance at McKinney Falls State Park. One person I turned to for assistance in creating our program was Mary Krupa-Clark of Get to Know, a national group that has been inspiring connections between children and nature in the outdoors for more than a decade. Renowned naturalist and painter Robert Bateman and Krupa-Clark founded the organization in 1999. Get to Know had developed an art in the park activity guide for use in any park or green space. It was a perfectly designed, easy-to-follow guide to inspire art throughout a park. Get to Know also hosts a national art contest for youth 19 and under with five categories: art, writing, photography, video and music. Texas state parks are hosting our own contest in conjunction with the national contest. To enter, kids post their artwork on the Get to Know website and name the park that inspired the piece. There’s an online Texas state parks gallery to view all the creations. Back in 2013, the first Texas state parks entry was submitted to the contest — by my son, Charlie H, age 8, Bastrop State Park. Charlie’s twin brother and younger sister joined in, and the gallery began to grow. Texas joined the online contest halfway through the year, and by the end of the contest in November, young artists had posted more than 100 entries. The 2014 contest ended with a compilation of winning art, photography and poetry displayed in a beautiful 2015 Texas State Parks Calendar. Our TPWD Exhibit Shop was inspired by our Arts in the Parks program, designing a program to allow park visitors to make their own greeting cards. Using a traditional printing press with hand-carved linoleum printing blocks, adults and children created beautiful mementos of their park stays at Meridian State Park and McKinney Falls State Park. This program has become so popular that we’re exploring ways to bring it to other parks across the state. In another use of this technique, we created a special printing block for visitors to commemorate the Battleship Texas’ 100-year anniversary. What else could we offer, I wondered. We reached out to VSA Texas, the state organization on arts and disabilities. A few meetings and calls led to a pilot program held in several parks last spring. 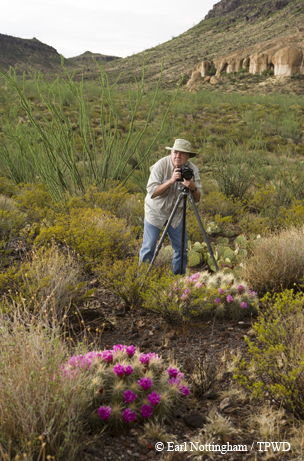 Photographers look for the perfect shot at a Big Bend Ranch photo workshop. New partnerships continue to pop up. 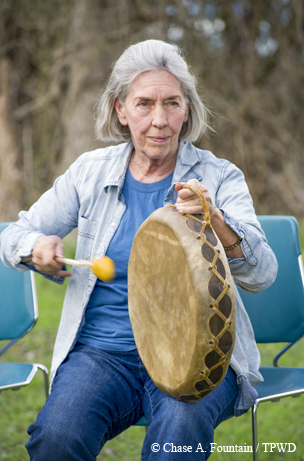 The Texas Commission on the Arts will host art programs at Texas state parks that qualify for the commission’s rural outreach program, and will offer free performances by Texas artists in designated rural counties. This spring we will promote our own Texas state park digital photography contest, open to adults and children, and will host several digital photography workshops in parks. This year, state parks will also coordinate with the National Park Service “Find Your Park” campaign, celebrating the centennial of that organization. “Our campaign will encourage Americans to ‘Find Your Park’ — to discover a personal connection to a place or a story that provides inspiration or enjoyment,” says National Park Service Director Jonathan B. Jarvis. How can you find art programs in a state park near you, or one you plan to visit? There are plenty of state park calendar listings each month, and you can sort them to find the “art” events (check http://tpwd.texas.gov/state-parks/programs/arts-in-parks/). The Arts in the Parks programs are as varied as the state parks themselves, with something for everyone, whether you love to draw, take photos, write, sing, dance, sculpt, act, take videos, make prints or, yes, even fingerpaint like me. That Charlie, he was right! 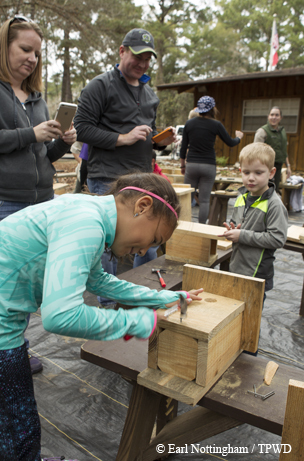 Kids try their hands at making bluebird boxes at Martin Dies Jr. State Park. The 2013 State Parks Photo Contest captured magic moments at state parks across Texas. The 1,600 entries from more than 600 photographers were judged on composition, creativity and overall impression. Our parks never looked so good. State parks represent ideal locations for photographing the state’s most remarkable scenery, plants, wildlife and landmarks. Texas state parks are hosting an art contest for youths 19 and under in conjunction with the Get to Know organization. The contest runs from May 1 to Nov. 1. Entries will appear in the Texas State Parks Gallery on the Get to Know website; last year’s winning entries were featured in a 2015 calendar.